tom (Homepage) wrote: Amazing reflections. Excellent! Mario Jean (Homepage) wrote: Fabulous composition and editing. Very, very well done. Denis (Homepage) wrote: Simply outstanding. I ma stunned. I have no words. Sorry for that ! Marco Marques (Homepage) wrote: Wow man... nice work. Amazing. Keep in touch. Framed and Shot (Homepage) wrote: Great reflections. The facade is sufficiently broken up that the reflection becomes a challenge to work out. Nice work! claire (Homepage) wrote: amazing shot. i love the many reflections and your processing. superb! 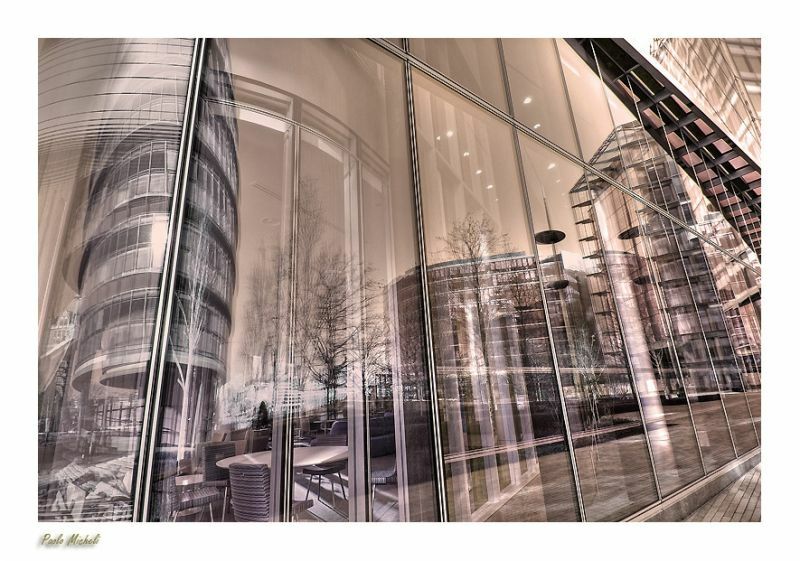 rem_la (Homepage) wrote: belle reflection urbaine ! Ilger.nl (Homepage) wrote: What a great choice to go for sepia here and the perspective you took taking this shot. See some purple toning as well if i'm right. Gives a bit a hdr kind of look. Mirko Herzner (Homepage) wrote: This is lovely. The colors and effect are amazing. Claus Petersen (Homepage) wrote: Fantastic reflection, the details are endless! Laurie (Homepage) wrote: Awesome reflections. Cool! Liang (Homepage) wrote: love the transparency you've shown here! Nick (Homepage) wrote: Fantastic. Love the lines and the reflections. Krims@nline.be (Homepage) wrote: Love this one, do you care to explain how you lade it ? Deepcut (Homepage) wrote: Fantastic interplay of reflections! 613photo (Homepage) wrote: Awesome shot, Paolo. Terrific use of the reflections. philipp (Homepage) wrote: absolutely great! how did you process this? greetinx! Donelia Pérez (Homepage) wrote: Lovely image. I love the soft colour. beanow (Homepage) wrote: The splendid processing! Excellent reflections and colours. Super! martie (Homepage) wrote: Beautiful reflections! Frida (Homepage) wrote: This is a great image. Love the reflection and the futuristic feel about it. Metropolis is a very good title. Elaine- (Homepage) wrote: beautiful colors, it looks like a painting, i love it!!! Polydactyle (Homepage) wrote: Excellent work. Impressive feflection and futurists colors. John Maslowski (Homepage) wrote: Simply outstanding, the reflections are superb and the processing exceptional. Love this image, so surreal. sherri (Homepage) wrote: Absolutely gorgeous capture. Such a beautiful structure and the lines and reflections are amazing. mbecher (Homepage) wrote: Loads of beauty in here. I really like your color treatment. eyeswideopened (Homepage) wrote: wow! what a shot! this toning is amazing! Sabine (Homepage) wrote: Wow - frantic yet calm. I like it a lot. Colors are nice also. Marcie (Homepage) wrote: Fantastic reflections. Hard to tell what's real..from what's simply reflecting off the glass surface. Love the soft warm colors.